a young creature also starts a journey of her own. this journey from yard to barn. and visit with friends and neighbors. "So, how long you lived 'round these parts?" But, now the sun has gone, and so must she. and then you eat for a little while. take a lot outta a girl. with one of those high energy drinks that are all the craze right now. (Don't worry if you've never heard of it, it's new on the market). you lose all sense of manners. "I don't need no stinkin' napkin!" the dreamland world full of green pastures and endless hay fields. entry from cement to building. "I now bid you all, sweet dreams and goodnight." Are y'all getting sick of her yet? I just realized I've done three CCs about her in a row... sorry, bout that! I just can't resist her. Forgive me, I didn't name her "Shirley" because... well, because that's my Mother-in-law's name. hehehehe. You just want to hug him don't you. Evening on the farm is very evocative. Cute little cow, lovely pictures. I loved the first one with just the shadow. Excellent photos. Like dirk, I really like the first one. The shadow tells a story. Nicely done. 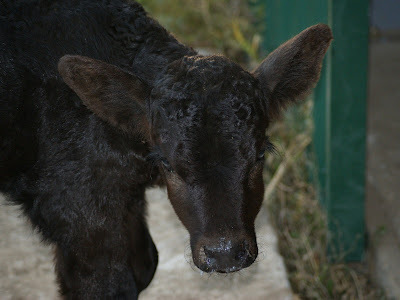 Wow, Misty, this is a beautiful series about the life of a calf and its needs. He is such a lovely adorable critter! And above all I like the poem very much! this baby cow is such a cutie! she's famous now!! keep posting about her. i'd love to watch her grow up! 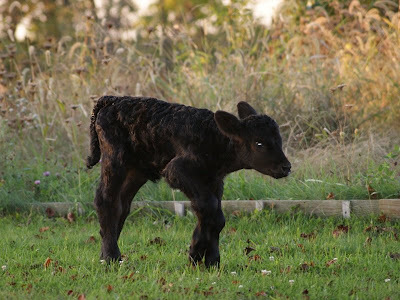 I'm thoroughly enjoying reading about and seeing all the great pictures of the little calf! Great shots! Ah! This is such a sweet post and your telling of her story was so natural. For me, I hope you keep telling her story so we can watch her grow right along with you. She is a precious critter. I love the shot where she is feeding and looking at the camera. That is such a parable of life, Mist. Great work - and I love the first shot especially. To be honest I didn't realize that it was three weeks in a row, especially by the time you get through all of the other posts. She is very cute and I can understand the need to use her over and over again for posts. Great little commentary to go with the photos. Thanks for sharing. 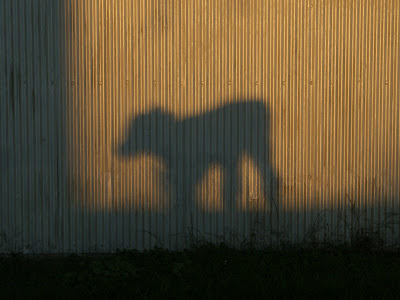 What a cute baby :) The shadow pic is very cool! So sweet! Totally understand about the name! She's so cute!!! I want her!!! Bring her up for me K? You post as many as you like, just so cute. Mooooo you're a lovely one! hugsss! she's just so cute. :) what's her name then? Awww! Such a sweet calf! I'd like to give her hug too. Great photos! Wow, that is a good series, Misty. 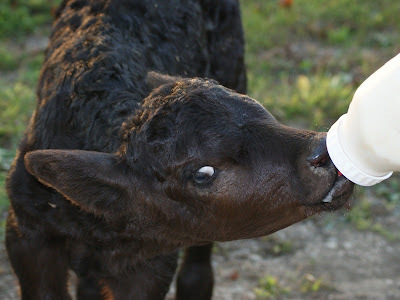 The calf is especially endearing. She is the cutest baby!!! I love her!! What IS her name? Those are wonderful shots. I love the first one. The shadow makes it mysterious somehow. What a great set of captures! Don't apologise. She is beautiful. What is her name then? 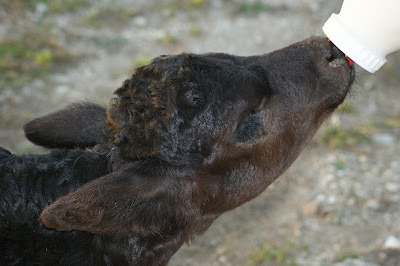 Misty: What a neat shot of the baby calf on the bottle. That one look said get away. Busy weekend and hard to keep up. Beautiful shots! And she is so cute! i so love this post, misty! No, I'm not tired of her. She is absolutely adorable! Love the shadow shot! Really great one! 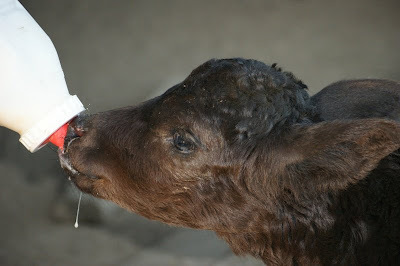 ooohhhh,aaaahhhhh, I just love the pictures of little guy drinking from the bottle! What fun! Now I have to go back and check your other posts about her...I have raised a few on a bottle and I am totally enjoying seeing these. This post was like a brief journey in your world! Just brilliant! And loved the pics, especially the one without a napkin!